The United States Virgin Islands (commonly called the U. S. Virgin Islands or USVI) are a group of islands in the Caribbean that are an insular territory of the United States of America (commonly called US). The U. S. Virgin Islands has all the beauty of the Caribbean with all of the conveniences of the US. The USVI are known for their white sand beaches, strategic harbors and rum production. English is the official language. The currency is the US dollar. The voltage is the same as the US mainland utilizing type A electrical receptacles. Best of all, passports are not required for US citizens traveling to the USVI. U.S. Virgin Islands mail service is handled by the United States Postal Service, using the two-character state code "VI" for domestic mail delivery. Zip codes are in the 008xx range: 00801 to 00805 (St. Thomas), 00820 to 00824 (Christiansted), 00830 to 00831 (St. John), 00840 to 00841 (Frederiksted) and 00850 to 00851 (Kingshill). UPS (United Postal Service), FedEx (Federal Express) and DHL Express also ship packages to and from the USVI. The U. S. Virgin Islands area code is 340. AT&T, Sprint, Choice, and Innovative are the most popular cell phone providers. Verizon, T-Mobile, and other cell phone services are available but international roaming charges may apply. There are local, national, and international internet service providers. Students and faculty typically use wireless network interface controllers to surf the internet using their AT&T or Sprint accounts. Free Wi-Fi is available to the UVI community on the UVI campuses. The islands have AM and FM radio stations (mostly on St. Thomas and St. Croix) broadcasting music, religious, and news programming. The U.S. Virgin Islands has 5 local television stations including PBS, ABC, CBS and NBC; extended cable and satellite television channels are also available. Newspapers include The Avis, The Virgin Islands Daily News, St. John Tradewinds, St. Thomas Source, St. Croix Source and St. John Sun Times. Tourism is the primary economic activity. The USVI normally host 2 million visitors a year, many of whom visit on cruise ships. The manufacturing sector consists of petroleum storage, rum distilling, and watch assembly. The agricultural sector is small, with most locally grown produce consisting of mangoes, bananas, coconuts, soursop, passion fruit, sugar apples, avocados, papayas, star fruit (carambola), pomegranates, limes, tamarinds, sea grapes, cucumbers, sapodilla (mespel) and bread fruit. International business and financial services are a small but growing within the 21st century economy. To draw more technology-focused companies and expand this segment of the economy, the government founded and launched the University of the Virgin Islands Research and Technology Park in conjunction with private businesses and the University of the Virgin Islands (UVI). Head start, preschool, and K-12 public, private and parochial education are available in the USVI. The schools are accredited and adhere to local and federal education guidelines. There are a variety of afterschool and summer programs for children. The Virgin Islands Public Library has a well-stocked collection of fiction, non-fiction and USVI archives. The University of the Virgin Islands is the U. S. Virgin Islands' only public, baccalaureate diverse institution of higher education. It is a land grant institution and a Historically Black College and University. The two campuses of UVI have a combined enrollment of approximately 2500 students. [UVI Fact Sheet] The institution offers more than 40 undergraduate and graduate degrees across its five colleges and schools. UVI is accredited by the Middle States Commission on Higher Education. Click for a full list of all of UVI's majors, minors and concentrations. The U. S. Virgin Islands are in the Caribbean Sea and the Atlantic Ocean, about 40 miles (64 km) east of Puerto Rico and immediately west of the British Virgin Islands. The territory consists of four main islands: Saint Thomas (commonly called St. Thomas or Rock City), Saint John (commonly called St. John or Love City), Saint Croix (commonly called the St. Croix, Santa Cruz or Twin City) and Water Island, as well as several dozen smaller islands. The total land area of the territory is 133.73 square miles (346.4 km2). Most of the islands, including St. Thomas, are volcanic in origin and hilly. St. Croix, the largest of the U. S. Virgin Islands, lies to the south and has a flatter terrain. More than half of St. John is deeded to the US National Park Service. The U. S. Virgin Islands are located in the Atlantic Standard Time zone and do not participate in daylight saving time. When the mainland US is on Standard Time, the U. S. Virgin Islands are one hour ahead of Eastern Standard Time. When the mainland United States is on daylight saving time, Eastern Daylight Time is the same as Atlantic Standard Time. 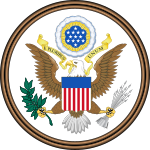 The U. S. Virgin Islands are an organized, unincorporated United States territory. The U. S. Virgin Islands are organized under the US Revised Organic Act of 1954. Residents of the U. S. Virgin Islands are US citizens. At the national level, the U. S. Virgin Islands elect a delegate to Congress from their at-large congressional district. However, the elected delegate, while able to vote in committee, cannot participate in floor votes. At the territorial level, 15 senators: seven from the district of St. Croix, seven from the district of St. Thomas and St. John, and one senator at-large from St. John. USVI senators are elected for two-year terms to the U. S. Virgin Islands Legislature. The U. S. Virgin Islands have elected a territorial governor every four years since 1970. Previous governors were appointed by the President of the United States of America. As of the census of 2010, the U. S. Virgin Islands included 106,405 people, 40,648 households, and 26,636 families. The racial makeup of the territory as of 2010, was 79.7% black or Afro-Caribbean, 7.1% white or Caucasian, 0.5% Asian and 12.7% mixed or other. [Source: UVI-Eastern Caribbean Center] The USVI is made up of a rich diversity of people from around the world including eastern and western Caribbean, US mainland and European descents. USVI residents are not subject to US federal income taxes on U. S. Virgin Islands income. However, the territorial tax managed by the VI Bureau of Internal Revenue mirrors US federal income tax codes. The U. S. Virgin Islands does not have a sales tax. The Henry E. Rohlsen International Airport (STX airport code) serves St. Croix and the Cyril E. King International Airport (STT airport code) serves St. Thomas and St. John. Flying time is approximately 3.5 hours from New York and 2.5 hours from Miami. The only way to get to St John or Water Island is by ferry from St Thomas; however, ferries operate between all the islands. The U.S. Virgin Islands are the only United States territory which drives on the left. Most cars being imported from the mainland United States are left-hand drive. There are plenty of car, scooter and motorcycle rental agencies available. Mass transit is available on St. Thomas, St. Croix and St. John. Public transportation is available through VITRAN. On St. Thomas, safari taxi and dollar rides are available from UVI to east-end (Red Hook) and back. On St. Croix, taxi buses provide transportation from Christiansted to UVI and to Frederiksted. Safari taxis are also available on St. John. Temperatures are fairly consistent year round, with the hottest temperatures, during summer, in the 80s and 90s. The winter months are the coolest with temperatures ranging between 70 and mid 80s. The USVI residents enjoy a tropical wet-and-dry climate, affected by moderate trade winds. Hurricane season is from June 1 to November 30. Late summer is the height of hurricane season in the USVI. Hurricane development is monitored; therefore, watches and warnings are given several days in advance. The last major hurricane that affected the USVI was Hurricane Marilyn in September 1995. Previously, there was Hurricane Hugo in September 1989. As a US territory, the Federal Emergency Management Agency (FEMA), Virgin Islands Territorial Emergency Management Agency (VITEMA), and USVI National Guard reservist are available if assistance is needed.